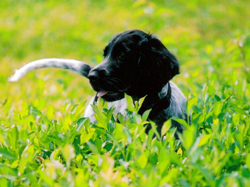 The Large Munsterlander is a long-haired German Pointer which has its origin as a color variation of the German Longhaired Pointer, and originated in the area of Münster in northwestern Germany. 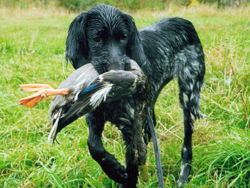 The Large Munsterlander is a Versatile Hunting dog whose major strength lies in his biddability, trainability and his ability as a versatile hunting dog with emphasis on the work after the shot. 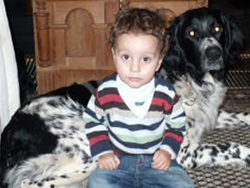 The German Longhaired Pointer fans decided in 1908 to no longer register their black and white offspring. 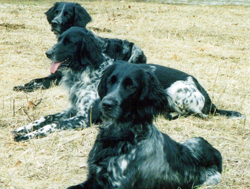 Subsequently the Large Munsterlander club was formed in 1919 by a group of people that intentionally pursued the breeding of the longhaired, large, black and white Munsterlander Pointer and in 1922 the Large Munsterlander Pointer (Grosser Muensterlaender Vorstehhund) breed registry was started with 83 dogs. Due to their abilities and excellent temperament these dogs were mostly kept in the house or barn as hunting, companion and guard dogs-rarely were they kept as kennel dogs. Those who decided to breed the Large Munsterlander valued its strength in thorny cover and it's unrelenting desire to track and retrieve while pursuing upland and small game. The Münster area of Germany was, and still is, rich in small game populations (including pheasants & hares), and the breed derives its name from the location where the breed was founded. 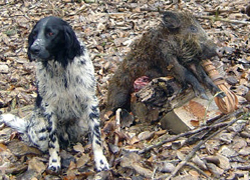 These hunting traits have been kept due to careful and selective breeding practices to maintain its reputation as a solid hunting dog. Large Munsterlanders are always black and white. Some dogs are white with black plates or ticking, and versions of roan dogs can vary from very white to dark. The head is black and can have a white snip, and the coat is medium long, dense, and with feathering on the legs and tail. The Large Munsterlander should be close to square in terms of length and height with a shoulder height of 23 - 25 inches for males and 22 - 24 inches for females with a weight between 50 - 75 lbs. Aside from the Large Munsterlanders impressive hunting and tracking abilities in the field, water and woods he is known as a great family and house dog. Pointing is genetically imprinted as well as the search pattern and the good use of nose. The Large Munsterlanders coat together with its desire and stamina makes the Large Munsterlander an excellent water dog before and after the shot. The Large Munsterlanders strong tracking ability also make him useful as a blood tracking dog. The Large Munsterlander can be used for all type of game, and is used in Europe for bird hunting as well as large game hunts. 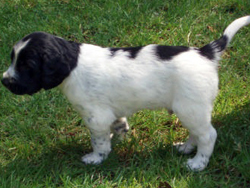 The Large Munsterlander in Germany, as well as North America, is being bred by hunters for hunters to maximize the desired traits passed on in each litter. Additional breed information for the Large Munsterlander can be found at the Large Munsterlander Association of America.